Seattle TV reporters tried to tie Washington State Ferries’ current boat shortage to crewing issues during a conference call with interim director George Capacci. While staffing has been a problem, as recently as Tuesday, the two are unrelated. Two boats are in dry dock undergoing scheduled maintenance. The 124-Kitsap is getting a paint job and the 144-car Yakima having drive motor work. The jobs were planned a long time ago, and won’t be completed until late September. WSF schedules more maintenance during winter, when business is slower, but it can’t all be completed without spreading into summer. Having two boats in planned maintenance this time of year is normal, said ferries spokeswoman Marta Coursey. What wasn’t expected was for two of the system’s largest vessels to break down. Ferry officials had been keeping an eye on a Wenatchee stern tube seal while searching for a dry dock. They had to go to Vancouver, B.C., to find one, and towed the boat there Monday evening. The very next day, on a trip from Seattle to Bainbridge Island, the Tacoma lost power. Capacci said Thursday they don’t know yet what happened, except that it’s an electrical problem, and he hopes to have a repair plan next week. So does the system have enough money to properly maintain the boats, a reporter asked. There is a backlog of deferred vessel maintenance, but the Coast Guard wouldn’t allow the boats to sail if they weren’t safe, Capacci said. Capacci and Coursey characterized the situation as “unprecedented,” and urged riders to sign up for alerts so they could stay informed. Those were the themes. The Wenatchee is expected to return Friday afternoon, but ferries officials didn’t think they could wait that long to restore a second boat to the Edmonds-Kingston route. They moved the 124-car Chelan down from the Anacortes-Sidney, B.C. route at noon. That wasn’t popular with Anacortes Chamber of Commerce director Stephanie Hamilton, who called this the town’s biggest weekend. Capacci said officials looked at reservations booked from Canada and weighed them against 5,500 vehicles the Edmonds-Kingston route carries every day. And, he added, it’s better to be without the Chelan Thursday and Friday and get it back for the weekend. A technicality came up Tuesday when the Walla Walla was providing single-boat service to Bainbridge. Normally it’s allowed to carry 1,800 passengers, but it was limited to 600 seats at a time they were needed the most. That’s the number its life rafts can hold, and by regulation the maximum number of people the ferry can carry without another boat on the route to help in emergencies. Capt. John Dwyer, Coast Guard chief of marine inspection in Seattle, happened to be in the WSF operations center when the Tacoma stalled and gave permission to load 1,200 people because the Sealth was nearby on the Bremerton route and could help rescue riders. The word never got to the boat or terminal, where customers were quite upset. Staffing problems on the Fauntleroy-Vashon Island-Southworth route Tuesday morning were only indirectly tied to boat problems. The connection was the boat — Evergreen State — being there because of the breakdowns. It was brought out of retirement to fill in for the Sealth and keep the route at three boats. But dispatchers couldn’t find a mate until 10 a.m., so it remained idle for five hours. Capacci sidestepped the issue Thursday, but spoke generally. “There’s a high demand for crews in the summer, but I think we’re meeting those targets of having those crews available,” he said. We’ll know come Nov. 19 whether a new Bremerton ferry is called Illahee, the name you chose. That’s the day the Washington State Transportation Commission is scheduled to vote on a recommendation from its ferry committee. The schedule was announced Wednesday. A press release soliciting names is forthcoming. We already have ours. Over the past couple months, you sent in dozens of names. We whittled them to the top three. In final voting, Illahee (179) more than doubled Suquamish (87) and Radulescu (84), the state trooper shot to death during a traffic stop near Gorst in 2012. Illahee means “land,” “country” or “place where one lives” in the Chinook language. It’s a pretty community and former Mosquito Fleet stop just north of Bremerton. A nearby state park also bears the name. The new Olympic-class ferry wouldn’t be the first to be named Illahee. One served the state for 59 years before being retired in 2007 because of rust. It was scrapped in 2009. Getting back to the schedule, name packets are due to the “Transportation Commission by Sept. 12. The ferry committee will check that they comply with guidelines and move them to Washington State Ferries and the Ferry Advisory Committee Executive Council for review. The two get a month to gather opinions before chiming in. “The key thing is that there is public support for the name and they’ve actually gone out and talked to people about it,” Reema Griffith, commission executive director, said of the name sponsors. The 12,000 members of the commission’s Ferry Riders Opinion Group will be able to participate in a poll. The Transportation Commission ferry committee will digest all the input the week of Nov. 10 and present its recommendation to the full body Nov. 19. Seven names were proposed for two ferries in 2012. The commission chose Tokitae and Samish. The remaining five could be back in the running this year. They are Ivar Haglund, Cowlitz, Hoquiam, Muckleshoot and Sammamish. All that’s left for us is to solicit backing from local, regional and state bodies and officials. I’d like to include support from you, even if it’s only a sentence. It’d be cool to send in a hundred sentences from those who actually selected the name. It’s been a couple years since the last names were chosen and I never wondered why. While the state was determining how to pay for the third ferry, another boat jumped in front of it at Vigor shipyards, WSF interim director George Capacci told the commission Wednesday. Capacci said the Tokitae’s introduction to service June 30 was seamless, the smoothest he’s been involved with in 20 years. Commissioners wanted to know about vehicles scraping going to the upper car deck. Money is coming in fine for the new 144-car ferries. A 25-cent capital surcharge was added to each ticket to pay for bonds to build the first two boats. The debt payment is about $5 million per biennium while the surcharge is generating about $7.8 million, WSF finance director Jean Baker told the commission. The Legislature passed some fee increases last session to help pay for the third boat. Fare revenue in general has been up. During the 2011-13 biennium, it was $1.2 million over projections. This biennium is looking to be $1.5 million more. 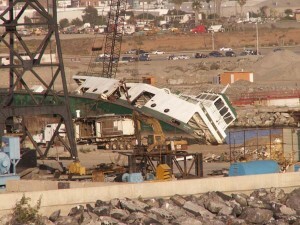 Here’s the old Illahee being scrapped in Ensenada, Mexico, in 2009. There could be another Illahee in the state’s ferry future. That was clearly your favorite name for the new boat that’s coming to Bremerton in a couple years. Now I have to usher the name through the bureaucracy and get it picked by the state Transportation Commission. The first Illahee served the state for 59 years before being abruptly yanked in 2007 because it was rusting away. It was scrapped in 2009. Over the past couple months, you sent in dozens of names. They were whittled to three most popular — Illahee, Suquamish and Radulescu. In final voting last week, Illahee received more than half (179), though Suquamish (87) and Radulescu (84) also showed solid support. It might’ve been more fun to crusade for Tony Radulescu, the state trooper shot to death during a traffic stop near Gorst in 2012. Many of you realized that would probably be in vain, however. The guidelines state that names honoring individuals should be avoided, but will be considered it the person has been dead for at least 20 years and has enduring fame. As beloved as Tony was, he doesn’t meet those criteria. Several of you mentioned he deserved to be memorialized, but in a different way. Tony got more support from you than the votes indicate. Radulescu also bucked the guideline that the name be consistent with existing fleet names. With the imminent retirement of the Evergreen State, they’ll all be tribal words. Illahee fits. It means “land,” “country” or “place where one lives” in the Chinook language. It’s also a pretty community three miles north of Bremerton overlooking Port Orchard Passage that was a former Mosquito Fleet stop. A nearby state park also adopted the name. The naming process hasn’t officially begun. Washington State Ferries first has to sent the Transportation Commission a schedule for when it needs one. Then the commission will formally solicit names. It’ll be up to me to build a case. I have to show how Illahee conforms to the ferry-naming guidelines, provide background, and get letters of support from local, regional and state bodies and officials. I’ll be pushing this as the people’s choice, so it would be great if you want to write up your thoughts and send them to me. The proposals first go to the Transportation Commission’s ferry team, which reviews them for compliance. Eligible ones advance to the full commission, the ferry advisory committee executive council and Washington State Ferries for review and input. They’ll be posted on the Transportation Commission’s website for public comment. The full commission looks at all the input and the ferry team recommendation and makes its decision.